MLB.com is the official site of Major League Baseball and is overseen by Major League Baseball Advanced Media, L.P. (a subsidiary of MLB). MLB.com is a source of baseball-related information, including baseball news, statistics, and sports columns. MLB.com is also a commercial site, providing online streaming video and streaming audio broadcasts of all Major League Baseball games to paying subscribers, as well as "gameday", a near-live streaming box score of baseball games for free. In addition, MLB.com sells official baseball merchandise, allows users to buy tickets to baseball games, runs fantasy baseball leagues (both free and paid), and runs auctions of baseball memorabilia. In association with HB Studios, MLB.com has also developed recent R.B.I. Baseball installments. MLB.com also contains the full, unabridged, official rules of the game. 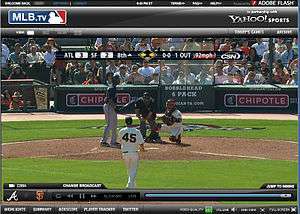 MLB.tv is an American subscription based audio and video service which through two different service tiers allows users to hear and watch HD quality Major League Baseball games live via a high-speed Internet connection. Both MLB.tv Basic and MLB.tv Premium subscribers receive In-Game highlights and stats, Live game DVR control, Mosaic view, Full Game Archives, Audio overlay (Away radio audio overlay is available to MLB.tv Premium subscribers only), Pitch by Pitch widget, Clickable linescores and Fantasy player tracker. MLB.tv basic subscribers can only view and hear the service using their desktop or laptop computer whereas MLB.tv Premium subscribers can in addition to their computer have access to audio and video using their mobile device such as Android or iOS devices through a free subscription to the At-Bat mobile app and through certain connected devices including smart televisions, Blu-ray players, TiVo DVRs, PlayStation 3, Xbox 360 and PlayStation 4. Starting with the 2012 season MLB.tv Premium has begun a service called Audio Overlay which allows the user to replace the video's home or away audio with the audio feed from the home or away radio feed (Away team audio overlay is only available to MLB.TV Premium subscribers) or Park which removes all audio commentary and lets the viewer hear the ball park's natural sounds. As with MLB's Extra Innings cable and satellite television service normal blackout restrictions will apply where applicable, see below. MLB.tv is also available as a channel on Roku, offering HD quality and a choice of audio feeds, but lacking some of the other advanced features. Also there is MILB.tv which covers all AAA and AA teams along with postseason and select other games, which you can get a discount to when you subscribe to MLB.tv. All subscriptions of MLB.tv Premium include Gameday Audio. MLB.com has been providing streaming video since the 2002 season, with only audio available before that. However, in the United States, Canada, South Korea, Guam and the US Virgin Islands, blackout restrictions apply. Games are blacked out to all users within the theoretical home television territory assigned to each team, irrespective of whether local television stations carry local games of those teams. Contractual stipulations with Fox and ESPN respectively mean that regular season Saturday games scheduled before 1900 EST (beginning 20 May 2006) and Sunday games scheduled after 17:00 EST are blacked out throughout the United States. During the post-season, all games are blacked out in the United States, Canada, Japan, South Korea, Guam and the US Virgin Islands. In all other countries and territories, no exclusivity rights have been granted and MLB.com is able to broadcast all games. MLB Gameday Audio does not have blackout restrictions. A screenshot of the MLB.com At Bat 2010 iPhone App scoreboard page. MLB.com Fantasy has many games and simulations, including Beat the Streak and MLB 2012 Fantasy Baseball. Beat the Streak is a game where a player is picked for each day, and if that player gets at least one hit, one's streak continues. The goal being to Beat the all-time record of Joe Dimaggio's 56 games, to win a grand total of 5.6 million dollars. This contest in its 15-year history, has never had a winner. MLB 2012 Fantasy Baseball is where one can make up to five teams and draft players. The real-life performance of a player directly determines the amount of points that player earns in the fantasy game. Major League Baseball's previous website was at www.MajorLeagueBaseball.com. The MLB.com domain name was originally registered in 1994 by Morgan, Lewis & Bockius LLP, a Philadelphia-based law firm. In September 2000, Morgan Lewis & Bokius agreed to transfer the domain name to Major League Baseball. The longer address remains as a redirect to MLB.com to prevent cybersquatting.